Fairmont Village Clerk Linda Carroll was honored the morning of December 28, as the USDA Rural Development Clerk of the Year. 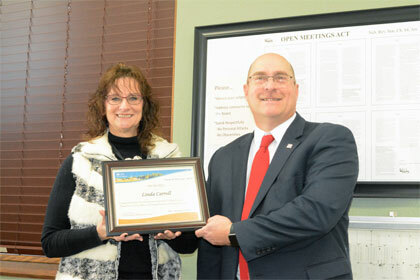 New USDA Rural Development State Director Karl Elmshaeuser presents the award to Carroll. Linda has been the clerk for the Village of Fairmont since April of 1991. The Fairmont Village Board has been active recently with a half dozen USDA Rural Development projects totalling over $1.5 million. USDA staff members noted that Carroll is always a pleasure to work with and assists with paperwork in an efficient manner. Linda’s two daughters and sister attended the December 28 event, along with village board members, city staff, local economic development personnel. Carroll was also presented an American flag.